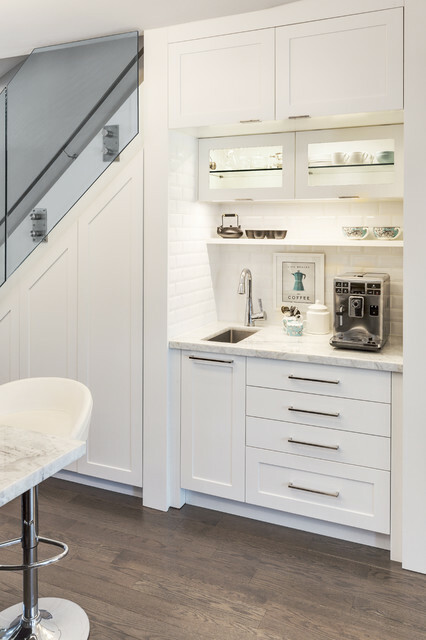 The space under the stairs was made useful as a coffee bar and for overflow storage. Ample lighting and a sink make it useful for entertaining as well. If your kitchen is too tight to accommodate a coffee machine on the bench, that space under the stairs could be given a new purpose. This coffee and tea station puts everything you need right where you need it. Drink your own coffeeIn a similar vein to baking your own bread, investing in a coffee machine and bean grinder will encourage you to make your own good-quality coffee to drink at home and take away. A thermos flask, or a sustainable coffee cup, not only keeps a few extra dollars in your pocket each day, it will save on environmentally harmful coffee cups too. 7. Seeing doubleIf you have some spare or wasted space nearby but not quite in your kitchen, you may be able to utilise it by incorporating an extra bench.If it’s a little out of the way, it’s doubtful you would use a second bench for cooking or food preparation, though that doesn’t mean you can’t treat it as a different work zone in its own right. An extra bench could become a dedicated space for making your morning coffee away from the hustle and bustle of breakfast, a mini-bar stocked with delicate glassware and wine, or even an appliance storage cupboard to free up room on your main kitchen bench. Julia Fairley added this to Kitchenettes: What Are They and Do You Need One? Johnson agrees, and adds that a kitchenette’s must-have inclusions vary depending on the function it needs to serve.“The essential inclusions for a kitchenette are related to the five zones: cooking, cleaning, consumables, non-consumables and preparation,” he says. “Food preparation areas are often the most neglected zone of the kitchenette; useful bench space is a must and should be a genuine consideration during the design stage.”Ellard also believes that drawers trump cupboards every time, especially when space is tight. “They offer much more practical and accessible storage space than cupboards and can be used to store a multitude of items from dried food to plates, pots or even glassware,” she says. Exactly my vision of how I see the wall in kitchen where Darryl’s coffee maker will go, as well as a small sink. I’d like my sink to be just a little bigger. Luxor Collection by Créa-Nova INC.